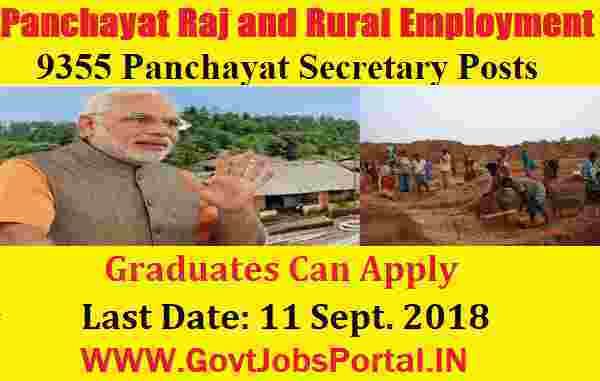 Government jobs in India for Panchayat Secretary posts in Telangana State. There are total 9355 vacancies which are going to be filling up through this Panchayat Raj Recruitment process. A notice related to this recruitment procedure is out on the official website of “commissioner of Panchayat Raj and Rural Employment”. We share this information on the basis of that notice only. The official notification is also available on the following website: “ https://tspri.cgg.gov.in “. All Indian fresher Graduates are eligible to appear in this recruitment procedure. More information related to these Telangana Govt jobs is given below in this article. So read the whole post carefully before applying online to these Government jobs in India. What are the Eligibility Criteria for applying these jobs? Education: All Indian fresher Graduates can apply for these Telangana Govt jobs. Candidates having graduation degree in any stream including Science, Commerce and arts can apply to these posts. Age Bond: Applicants having minimum age of 18 years and maximum age of 39 years can apply for this recruitment process. All fresher Graduates having age in between this age figures can apply online. What is the application Fee for applying these Government jobs? Online Mode can be use for the payment of application. What is the process to Apply Govt jobs in Telangana? The process for applying these Government jobs in India is to apply online. You have to apply online through the official website of the department. The link for applying online will be active on 3rd Sept. 2018 and the link will stay activated up to 11th Sept. 2018. So those who are wishing to apply these Telangana govt jobs have to apply online between these dates. At the last under IMPORTANT LINK section we share the link for applying online as well as for the Advertisement. Check that section for more information. 03RD Sept. 2018 is the opening date to apply. 11th Sept. 2018 is the Last Date to apply.